This is the new normal or, more accurately, the old tricks of fascists and totalitarians. It’s much like the Reichstag fire was used as evidence by the Nazi Party that communists were plotting against the German government. It wasn’t, but that wasn’t the point, was it? It was the pretext to impose freedom-crushing laws. Shortly after Hitler was sworn in as Chancellor of Germany, he used the Reichstag fire to pass an emergency decree to suspend civil liberties and pursue a “ruthless confrontation” with his political enemies. Anyone who cannot see the historical similarities are destined to repeat them. The “hate-crime” mosque fire at Islamic Center of Des Moines was actually set by Aisha Ismail. The same mosque was the target back in March of an anonymous, threatening handwritten letter which referred to Muslims as “vile,” “filthy,” Repeat fake hate. Yasmin Seweid, a Muslim college student, claimed that Trump supporters had tried to tear off her hijab on the New York City subway and shouted, “Look it’s a f______ terrorist” and “Go back to your country”. “The president-elect just promotes this stuff and is very anti-Muslim, very Islamophobic, and he’s just condoning it,” she complained. An Islamophobia hoax doesn’t get any more discredited than the Seweid case. But Islamophobia hoaxes never die. They’re rolled into hate crime statistics and reports even when they are completely false. “Reported anti-Muslim hate incidents, rhetoric rose in year after election, report finds,” NBC News claims. Like The Nation, Think Progress and a variety of other sites, it’s touting a report by South Asian Americans Leading Together or SAALT. The SAALT report, “Communities on Fire,” fits into an annual media tradition. Every year, fake statistics are used to inflate the Islamophobia threat. And the media reports every year that Islamophobia is getting worse. The statistical gimmicks of Islamophobia inflation vary from the clever to the terrible. The Southern Poverty Law Center hit a new low when it claimed that the “number of anti-Muslim hate groups increased almost three-fold in 2016” by counting 45 chapters of Act for America as separate organizations after counting them as one in 2015. Another report documented a 66% increase when 6 cases increased to 10. But the SAALT report’s listing of discredited hoaxes is even more outrageous. And that’s far from the only hoax on the SAALT list. The Muslim student claimed that she had been attacked by Trump supporters. She was charged with filing a false police report. “She made up the entire story about being attacked, about her hijab being taken. There was no truth to any of it,” the Lafayette Police Department spokesman said. That story was also a hoax. “Following a thorough investigation, detectives have determined the incident in question did not occur,” the Ann Arbor Police Department stated. These weren’t just hoaxes. They were hoaxes from over a year ago. And SAALT still included them. “An anti-Muslim message was spray painted on a residence hall on the Beloit College campus,” the report claims. The student confessed to having vandalized his own door with anti-Muslim graffiti. He was arrested and charged with criminal damage. “Two men confronted a San Diego State University student wearing hijab in a parking structure, made comments about President-elect Donald Trump and the Muslim community, and then took her purse and backpack. The men also took the student’s car keys and ran off,” the SAALT report claims. The car turned out not to be stolen. No evidence of the attack was found and the student refused to cooperate with police. Incidents like these, which were reported after Trump’s victory, play a crucial role in SAALT’s efforts to connect the supposed rise in Islamophobic attacks to him. The SAALT report mentions Trump nearly 200 times. It claims that, “One in five perpetrators of hate violence incidents referenced President Trump, a Trump policy, or a Trump campaign slogan.” But quite a few of those Trump “incidents” were hoaxes. The SAALT report lists violence that happened to Muslims without any evidence that it was motivated by their religion. It lists the drive by shooting of Mohamed Abdulkadir in Ohio, and the robbery and fatal beating of Ali Khan even though they appear to be ordinary crimes. The police report however quoted the victim as saying that she didn’t think it was a hate crime, that the man had not tried to take her hijab, but that the assault had to do with her lesbian daughter. The SAALT report lists arson at the Islamic Center of Ypsilanti. But the police ruled that out as a hate crime. A Detroit mosque whose vandalism was also listed by SAALT was trashed by an African-American thief when he couldn’t find anything to steal. The SAALT report lists the shooting of a 16-year-old Muslim in Ohio. The Muslim teenager claimed that his attacker had shouted racial slurs at him, but the attacker, Denzal Johnson, is African-American and his girlfriend appeared to be Muslim. Denzal’s religion is unknown. The SAALT report claims that “Black Muslim girl, Nabra Hassanen” was killed after she and her group had “been at a late-night event at the All Dulles Area Muslim Society and were headed back to the mosque after a trip to a fast-food restaurant.” Nabra Hassanen wasn’t black and she was killed by an illegal alien gang member from El Salvador who got into a fight with her friends. There’s never been any evidence that her killer was motivated by her religion. And he was not charged with a hate crime. Rahma Warsame had actually gotten into a fight with Samantha Morales, a Latino woman. Morales claimed that a Somali woman had hit a little boy with a shoe. According to the police, another member of the Warsame family, had tased Morales. The only white male in the story is Morales’ boyfriend. The police couldn’t decide what really happened. The SAALT report tries to attribute violent attacks on Muslims to “white supremacists”, but many of its more violent incidents are actually the work of African-American and Latino attackers. The Victoria mosque fire was set by a mentally unstable Latino man. 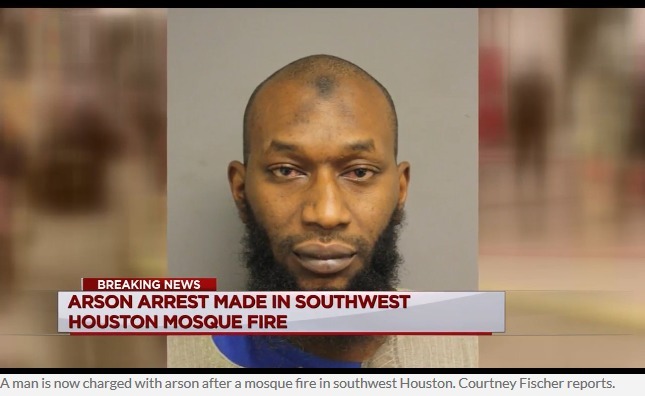 The Islamic Center of Eastside fire was set by a schizophrenic African-American homeless man who may have previously tried to pray in the mosque and had smashed a window at NikeTown. Not exactly your typical Trump supporter. A number of the acts in the SAALT report were actually committed by mentally unstable homeless people with a violent history. But SAALT has its own curious definition of white supremacist. According to the report, Act for America 9/11 commemoration illustrated a growth in white supremacist Islamophobia. But Act for America was founded by Brigitte Gabriel, a Lebanese Arab immigrant. The SAALT report not only includes hoaxes, but it attacks civil rights groups and defends hate groups. The SAALT report lists the Freedom Center’s campaign against hate groups. “Palestinian rights activists at California universities were targeted with posters calling them terrorists.” The posters called out SJP and other hate groups that have expressed support for terrorists. Many of the activists who were called out in these Freedom Center campaigns weren’t even Muslims. The first name on the poster that SAALT is complaining about is that of Daniel Alvarez. The second name is Mohammed Hammad who was investigated by terrorism officials and the FBI for posting violent threats. These included, “I think about killing a lot/and some of you are usually the targets of my daydreams.” Instead of condemning Hammad’s threats, SAALT instead attacks the Freedom Center. The SAALT report leaves out key pieces of information that might provide alternative explanations. It mentions that Vibert White, was “forced to resign” from the University of Central Florida and sued the college. It neglects to mention that he had been arrested three times on domestic violence charges involving two ex-wives. It mentions the vandalism at the Ahram Halal Market in Maine, but not that a few weeks earlier its owners had been charged with fraud. The multiple hoaxes that never happened and other incidents that were not hate crimes ought to be enough to raise serious questions about the credibility of the SAALT report. Unfortunately the media unthinkingly passes along Islamophobia inflation reports without ever fact checking them. The SAALT report and the media stories about it exist to push the narrative is that President Trump is causing anti-Muslim violence. And the narrative is too good to bother checking the facts. And that not only destroys the media’s own credibility, but hurts the people it claims to be trying to protect. When hoaxes, ordinary crimes and attacks by mentally ill homeless people are all treated the same way, then even real attacks will be drowned out by the torrent of fake incidents.